Thinking of a loved one or family member in another state, province or country this holiday season? Would you like to send them a gift but are not sure what would be appropriate and easy to send? Does this person or group have everything already so deciding what to gift to them is almost impossible? We think sending a gift basket for any of these circumstances can be just the right choice for a gift to celebrate the holidays (but, we are a bit biased too :-). 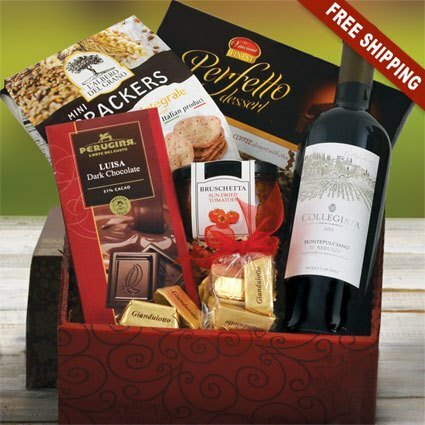 There are so many reasons that sending a gift basket makes sense. If your gift recipient lives far away from you, in another city, state, province, country or even across the pond, sending a gift basket from the country they are from eliminates all of the hassles of sending gifts - packaging, sending, shipping and potential duties and fees, and maybe even confiscation at the border. Yes, it can happen depending on what you want to send. For example, if you choose to send wine or champagne as a gift, it will not make it across any borders. You may try to send it but it will definitely be confiscated and most likely will not be returned to you and if it is, it will cost you that extra to get it back. So...your recipient does not receive the gift, you have had to go through the hassles of customs and duties, and you may have to pay to have it returned to you - which, in may cases, will not even happen - whew! 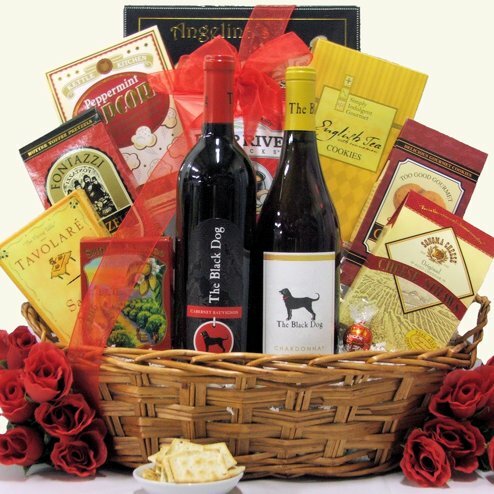 Is it really worth the effort yourself to try to send a gift basket with wine? The answer is unequivocally, NO. Let us look after that for you. We can find the best wine or champagne gift for your family, friends, colleagues or best clients and have it shipped to them with no hassles, no time and effort to package it, and definitely no confiscations at any borders. We make sure your wine gift gets to your recipient without any effort on your part. As we mentioned, our gifts take out all of the guesswork involved in sending a lovely gift of fruit, wine, champagne, gourmet foods or spa goodies. All you have to do is choose the one that you think best suits your gift recipient or recipients. We look after everything else. Imagine getting all of your Christmas gift giving done while sitting at home in your pyjamas. And sure there are other online stores where you can purchase gifts but be sure that the gift wrapping is actually gift wrapping. Let me explain. Personally, I have bought items from online shops where they offer the option of a gift card/note. When I received the gift to hand deliver, I looked for the gift wrapping and card. It was certainly not obvious and when I looked further, I noticed that the gift message was written somewhere on a package invoice. Arghhhh! It was a good thing I did not send this gift directly to my friend. They would not have known who it was from or where it was from - unless of course, they happened to see that tiny little line on the invoice with my gift message. Needless to say, this was not exactly what I expected when I thought I was sending a gift in the mail. Our gifts and gift baskets are specifically and beautifully gift wrapped - no doubt about it! We also include with every gift a special and obvious gift card with your personalized note. Our gifts and gift baskets scream GIFT - not an item packaged with an invoiced gift message. For those people who you know have everything - perhaps like your Mother, your Dad, Aunt or Uncle. Or for those people who you don't know very well personally - like a work colleague or new corporate client, a gift basket is a perfect gift. Everyone will be able to enjoy the contents of a gift basket. You can even find the perfect basket which contains a few items which you may know that they like. For example, if you know your corporate client across the country likes red wine because they happened to mention it in a work lunch conversation, send them a gift basket with a bottle or bottles of red wine. We have plenty to choose from with red wines from around the world. And nothing says you are special like a bottle of champagne. Whether it is for a loved one, a newly clinched corporate client or a special administrative assistant who got you through a tough year, a gift basket with some champagne will send exactly the right type of appreciative message. Remember that we look after everything for you from gift presentation, packaging to delivery so you don't have to worry about a thing. Your gift will be sent, delivered and surely enjoyed and appreciated. 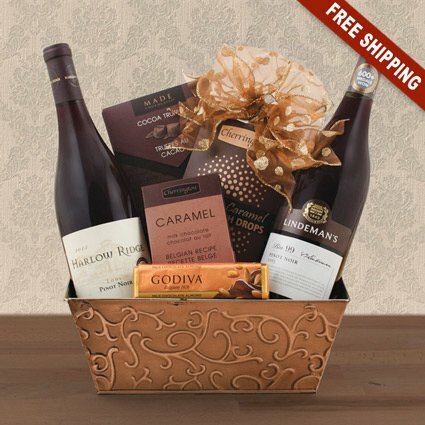 If you are sending this gift basket across the country, you will need to package it securely to send in the mail or via courier. 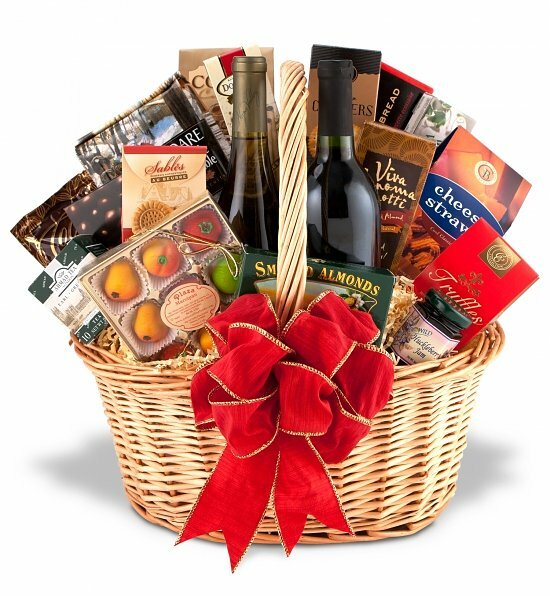 If you would like to send this gift to another country, there are a few important issues you need to consider before attempting to send the gift basket. For example, if you would like to send wine, you will not be able to ship this across the border between Canada and the United States - either way. As well, most food items and spa and bath lotions and creams are restricted from being sent from one country to another. If this is what you would like to send, you are probably better off choosing a gift basket company with locations or partners in the country of your gift recipient. They will be able to look after all of the details of legally sending wine, food or creams, lotions and perfumes to your gift recipient. Good luck, have fun and happy gift basketing! We know it is Happy...because that is what we do!